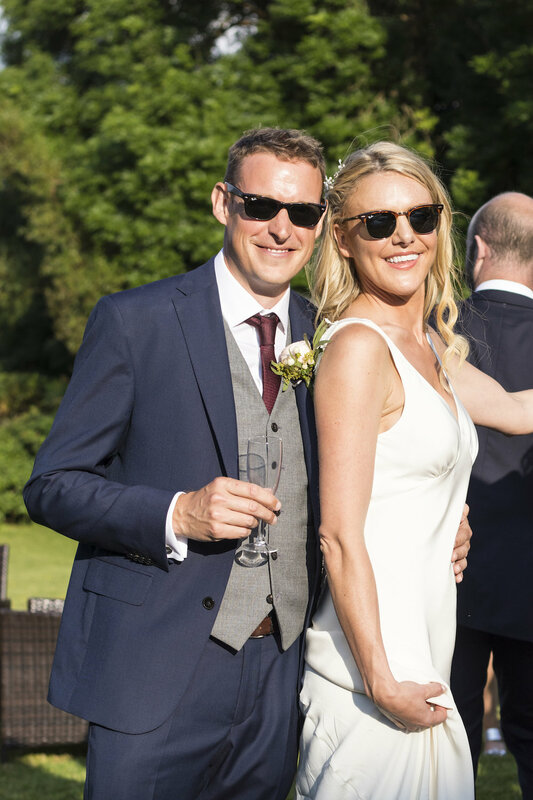 Our beautiful bride Emily married her beau in June this year in a relaxed and fun celebration with their closest family and friends. Just look at the scenery! I’m totally in love with everything about this lovely wedding. Emily chose our Vera feather dress and it suited her down to the ground. “To be honest I loved bridal dress shopping, however I had got to the point where all the dresses were lovely and I hadn’t a hope of narrowing it down because none, although all lovely, really jumped out as “the one”. I had become incredibly frustrated by this. I didn’t want a fussy dress, but before going to Halfpenny I had struggled to find something that was simple without being either boring or more suitable for a city wedding. I loved the flirty back of Vera and elegant simplicity of the front. The day I visited the boutique it had been wet and wild outside and as me, my mom, my sister and bridesmaid clutched to the handle of the one small umbrella, we turned onto the small street and it was just idyllic. Short of wrapping us in towels they got us dried off, in a warm cozy environment, got us settled and we began browsing the rails. It was heaven. Thank you for allowing us to be a part of your special day Emily! We wish you every happiness in your new lives together.